Take a stroll down the Formula 1 paddock on any given Sunday during the racing season and you'll likely see an array of celebrities in sunglasses, local politicians scanning for a good photo-opportunity and sports stars with their attendant entourage. One person you're unlikely to see mixing with F1's glitterati - or even recognise should he be present - would be Donald Mackenzie. And yet the reclusive and publicity averse 56-year-old is arguably the reason why the sport is still operating in its current form today. As co-founder of private equity group CVC Partners, he led negotiations when it bought a controlling stake in F1 in 2006. This week, he's been in the High Court in London, recapping how that deal was done and lifting the lid on the sport's inner workings as part of a case brought by a German media company, Constantin Medien, against F1's chief executive, Bernie Ecclestone. Constantin says it lost out financially when a stake in Formula 1 Group was sold to CVC for $830m (£514m at present exchange rate) because the sport had been undervalued. Constantin also claims the 83-year-old Ecclestone, who has built F1 into a global money-spinner over the past four decades, entered into a "corrupt bargain" with CVC because it planned to keep him on as chief executive. Now, through this civil case in London, Constantin is seeking £90m in damages from Ecclestone and his co-defendants. Ecclestone had his turn in court earlier this month and denied the claims, insisting the deal was done on its merits and he had "no preferred buyer". He also says Constantin's claim "lacks any merit" and denies any "conspiracy". There is little doubt that the collaboration between CVC and Ecclestone has been highly lucrative, but financial reward hasn't come easy, according to Mackenzie. He explained in court that, while CVC's purchase of F1 was one of the fund's "top 10" deals, he felt it had still been "sold a pup." "It's been an extremely difficult investment almost from start to finish," he explained. "It was constant crisis and firefighting." He claimed Ecclestone and selling bank BayernLB [BLB] had "oversold the business" and had left CVC "with a lot more problems" than it thought. According to Mackenzie, one was the uncertainty over the sport's long-term viability and marketability given the lack of a commercial agreement - known as the Concorde Agreement - between F1 teams, F1 management and the sport's governing body. "In that period between 2006, when we bought it, and 2009, we could not sell this company," said Mackenzie. "It was not sellable. No-one wants to buy Formula 1 when there's no Concorde Agreement signed." With the prospect of teams quitting F1 and forming a breakaway series, Mackenzie and CVC faced a potentially ruinous situation. "It really was a misjudgement by us," he said, explaining that CVC had not been aware just how fraught the relationship was between F1 teams and F1 management. "There was a history of anger," he explained. "This was like a very bad divorce. The husband and wife have been fighting each other for years and years and they could no longer see sense." Those who know Mackenzie describe him as a "deal junkie", a man who lives for the buzz of hunting down undervalued companies before extracting maximum value and selling them on for a profit. Away from work, he's a keen fan of country sports. A hunter of a different order. So spending countless hours thrashing out a painstaking deal to preserve F1's long-term future would have been anathema to him, a man with 25 years experience of holding his nerve and playing corporate poker at the highest level. "Thankfully we have agreed all these terms and we now have a stable series," he said. "But, at the time when I bought this business, it was an appalling mess and much worse than I realised." He also claims BLB has a lot to thank him for. "It was the luckiest day in those bankers' lives when I walked through the door," he said. This case also centres upon a £10m payment made by Bernie Ecclestone to a now jailed German banker at the centre of the deal, Gerhard Gribkowsky. Ecclestone denies the money was a bribe or was made in relation to the sale of Formula 1. Instead, Ecclestone says he paid the money to stop Gribkowsky "shaking him down" by giving UK tax authorities information about the structure of his family's financial trust. Donald Mackenzie, when asked in court about when he discovered the payment had been made, said he was "angry" and "surprised" that Ecclestone had "forgotten"' to tell him. "They couldn't have sold it to anyone else. No-one had the money, no-one had the know-how and no-one had, frankly, the balls to do such a risky deal." Since the renewal of the Concorde Agreement in 2009, F1 has gone from strength to strength.. Instead of a "bad divorce", there has been a renewal of marriage vows between F1's team and management, generating billions of dollars as its progeny. Speaking outside the courtroom, in a rare exchange with reporters, Mackenzie confirmed it was still the intention of CVC, which now has a 35.5% stake in F1 after selling down its holding from 63% last year, to float F1 on the stock exchange. But, after abandoning plans for a flotation in Singapore last year because of market turmoil, he added that there was "no plan in the imminent future" to make that happen. 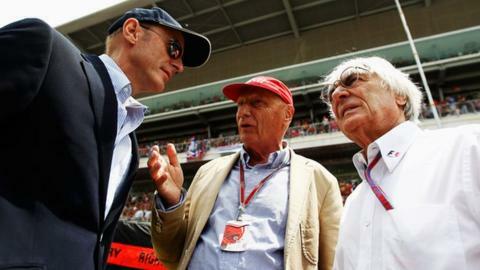 As for the future relationship between CVC and Ecclestone... well that is not so easy to predict. After a day and a half under cross-examination, it became clear that Mackenzie will not tolerate or permit wrong-doing on his watch. When Philip Marshall QC, representing Constantin, suggested that Ecclestone was effectively untouchable as the head of F1, Mackenzie made his stance absolutely plain. "We've always taken the position that if it's proven that Mr Ecclestone has done anything that's criminal or wrong we will fire him," he said. "But until that happens we will give him the benefit of the doubt, provided it is not seriously damaging the business of Formula 1. "At no time have we put our profit in this investment ahead of doing the right thing in this corporate governance situation." Closing arguments in this case are expected to take place in early December, with Ecclestone's lawyers having already denied the merits of the claim. Mr Justice Newey will then leave Court 26 and retire to consider his judgement, something he's not expected to deliver until early 2014. Only then will it be come a little clearer to Ecclestone and Mackenzie what impact this case will have on their respective futures and the sport which, for now, both are tied to. And for Ecclestone, there is still the threat of court proceedings in Germany, the United States and Switzerland in relation to the controversial sale of F1 seven years ago.